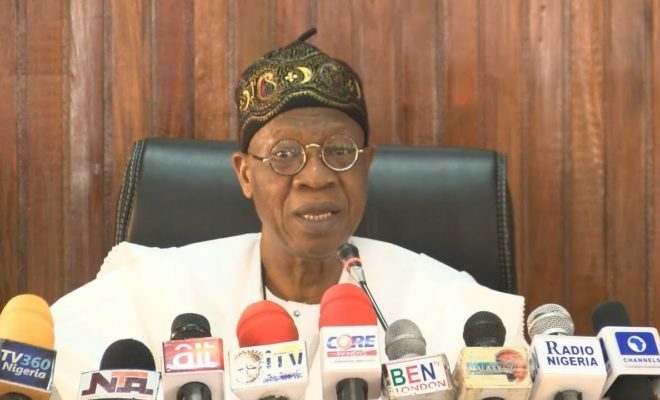 Information Minister Lai Mohammed defends the government’s record, talks up Buhari’s 2019 chances, and discusses the challenge of misinformation. Nigeria’s Minister for Information and Culture Lai Mohammed. The words typically used to describe Lai Mohammed in private are the ones you might expect. After all, to survive a couple decades in the crucible of Nigerian politics, one has to be fearless. To be an effective spokesperson for a ruling party, one needs a degree of wiliness – perhaps even slipperiness. And to ascend to the influential position of Minister of Information and Culture, one has to be a fierce and canny operator. When meeting Mohammed face-to-face, however, few of these characteristics come across immediately. The 66-year-old is small and unassuming. He is calm and gentle, using one’s own name to disarm you. And when placed under pressure, he doesn’t go on the defensive, but puts on the faint smile of a poker player pretending his hand is better than it is – on this day at least. African Arguments caught up with Lai Mohammed to talk about the government’s record in office, next year’s elections, and the Information Ministry’s plans (or lack thereof) to combat fake news. President Muhummadu Buhari came into office in 2015 making huge promises on security, the economy and tackling corruption. Which, if any, would you most want voters to judge his record on? I think he’s delivered on all three, but let’s start with security. When we came into government in May 2015, 24 local governments – three times the size of Lebanon – were under the effective occupation of Boko Haram. Even the capital Abuja was not safe. But today, Boko Haram doesn’t own one inch of territory. We have returned normalcy to the entire north-east. Boko Haram may be diminished, but insecurity has worsened between farmers and herders, in the Niger delta, and in the South East with Biafra separatists. These were all crises we inherited and have responded effectively to all of them. Before we came in, IPOB [the Indigenous People of Biafra] was everywhere. They were disturbing the peace by threatening secession. But after their proscription, they’ve gone underground. We didn’t need to fire a single shot. Today, IPOB exists largely in the minds of the people and the media. Designating IPOB a terrorist group inhibited their activities but the grievances of their supporters remain. You’ve said this is a government that listens. Would it not be better to listen than use force to silence? Frankly speaking, there are no grievances IPOB can legitimately lay claim to. We have a federal system where states are fiercely independent. In the five states occupied by Igbos, the governors, members of their cabinets, and local officials are Igbos. If you want to talk about marginalisation at the federal level, other groups can also say they are not adequately represented, but it is a matter of opinion. IPOB was a distraction we did not need. IPOB’s leader Nnamdi Kanu disappeared after a military raid in September 2017. Is the government’s position still that it has no idea where he is? Nnamdi Kanu knows where he is. Believe me. If he was in custody of the government for six or seven months, why would we keep him? I think he went underground and I think he knows where he is. The economy has struggled under your watch, suffering the first recession for decades. Do you regret promising 10% annual growth in your 2015 manifesto? I don’t remember that figure, but I’m proud of what we’ve achieved. We met an economy heading for recession. It was a matter of time, but within two quarters of going into recession, we came out of it and have since maintained steady growth. Our federal reserve has doubled from $23 billion [in 2016] to $47 billion. Capital inflow has grown to $6 billion in the first quarter of 2018. We’ve brought down inflation. We’ve been able to diversify the economy. Growth in 2014 was an impressive 6.3%. If you thought you’d be inheriting an economy in bad shape as you say, why did you make so many ambitious promises? It’s when you assume office you know the enormity of what you’re facing. Don’t forget that between 2011 and 2014, oil was selling at $100-120 a barrel. By 2015, it had plummeted to $60. All the things we achieved were at a time when the price of oil was down. What would you say to people who cannot feel the achievements you talk about, whose experience is still of unemployment, poverty and high costs of living? Once a country exits recession, there’s a lag period before you feel the effects. But having said that, this administration employed 200,000 university graduates in 2016. Under our social investment programme, we feed millions of pupils one meal a day and give monthly cash transfers of N5,000 ($14) to 297,000 of the most vulnerable households. We have spent N2.7 trillion [$7.5 billion] on infrastructure. We have elevated power production from 2,700MW to 7,000 MW today, and we expect to another 2,000MW before the end of the year. When people say they’ve not seen what we’re doing, they’re just being mischievous. On corruption, many people believe a lot was promised but little delivered and that the fight has been selective, as with previous governments. When you fight corruption, it fights back and furiously. Despite that, we’ve refused to be distracted. The former governor of Plateau state was just sentenced to 14 years on corruption charges. This was a serving senator in our own party. It debunks the argument that our fight against corruption is selective. But he was charged and his trial officially began before you even came to power. Of course, you are right. But if we’re protecting our own, how come he’s in jail? Some believed that if you defect to the [ruling] APC, all is forgiven. That’s not the case. Yes, the charges were filed before we came in. But we did not interfere with the prosecution or judicial process. Has the fight against corruption been harder than you envisaged? Of course. When people have stolen so much money, they’re so fearful and can buy space in the media to fight against you. The noise about selective application of the law is getting louder. Are you talking about specific people? Unfortunately there’s a court injunction that restrains me naming people. I have four injunctions today against my person. I wonder if one relates to former president Olusegun Obasanjo, a strong critic of Buhari, who says he could soon be arrested on false charges. We should not allow Obasanjo to hoodwink us. He felt so uncomfortable by President Buhari declaring 12 June Democracy Day and posthumously honouring the late MKO Abiola, winner of the 1993 annulled elections. For eight years as president, Obasanjo did not think it fit to honour Abiola. For 16 years, his party the PDP danced on his grave. To divert attention from Buhari’s momentous proclamation, he came up with the allegation that he was being investigated. Do you think either his or former minister Oby Ezekwesili’s attempts to create a third political movement ahead of the 2019 elections have any potential? I’ve never lost a night’s sleep over these threats. In 2013-4, the situation in which four opposition parties merged to form the APC was quite different. You were dealing with political parties that had proven their mettle and with a followership. Where are the parties or people today that are going to come together? How about the opposition PDP? They are trying to bring smaller parties together and claim several defections from the APC are imminent. Ideally, we don’t want anybody to defect and we want to manage everybody. But if anybody defects from the APC, I don’t think it’s going to affect the fortunes of the party. You’ve expressed confidence in Buhari’s re-election bid, but his approval ratings are down from 80% in 2015 to 41% last month. A huge 67% think he’s doing poorly on the economy. Without any prejudice to the integrity of those polls, I’m confident we will win very comfortably. Not because of I’m part of this government but because I know the pulse of Nigerians. Fake news was prevalent in 2015. What’s the government – and you as Information Minister – going to do to combat this? I think it’s going to be worse in 2019 and you can hardly legislate against it. At the rate social media is going, it might self-destruct. But before then a lot of damage will be done. People take for gospel truth what they see on social media and that is dangerous. So for any politician, you must not lose touch with your own constituency. You must continue to engage them. But in terms of legislation, it would be counterproductive to start to legislate against fake news now. So there’s no plan to combat misinformation? It’s incumbent on parties to deal with it themselves? The only thing you can do as a government is share that space with them. You must tell your own story. Have your own Internet warriors. It’s easier for us than for them. This is not a market of logic or rationality, but about whose voice is louder. The Information Ministry’s answer to the growing prevalence of fake news is fight fire with fire? I think that’s the only solution.